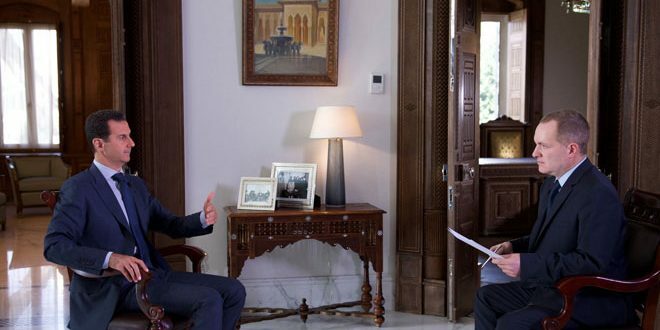 Journalist: President Assad, thank you very much for this opportunity to be interviewed by the Associated Press. Question 1: I will start by talking about the ceasefire in Syria. Russia, the US, and several countries say a ceasefire could be revived despite the recent violence and the recrimination. Do you agree, and are you prepared to try again? President Assad:We announced that we are ready to be committed to any halt of operations, or if you want to call it ceasefire, but it’s not about Syria or Russia; it’s about the United States and the terrorist groups that have been affiliated to ISIS and al-Nusra and Al Qaeda, and to the United States and to Turkey and to Saudi Arabia. They announced publicly that they are not committed, and this is not the first attempt to have a halt of operations in Syria. The first attempt was in last February, and didn’t work, I think, because of the United States, and I believe that the United States is not genuine regarding having a cessation of violence in Syria. Question 2: Do you believe there could ever be a joint US-Russian military partnership against the militants, as outlined in the deal? President Assad:Again, practically, yes, but in reality, no, because the United States doesn’t have the will to work against al-Nusra or even ISIS, because they believe that this is a card they can use for their own agenda. If they attack al-Nusra or ISIS, they will lose a very important card regarding the situation in Syria. So, I don’t believe the United States will be ready to join Russia in fighting terrorists in Syria. Question 3: This week, the US has said the coalition attack on Syrian troops was an accident. Do you accept that explanation? President Assad:No, no. It’s not, because it wasn’t an accident by one airplane for once, let’s say. It was four airplanes that kept attacking the position of the Syrian troops for nearly one hour, or a little bit more than one hour. You don’t commit a mistake for more than one hour. This is first. Second, they weren’t attacking a building in a quartier; they were attacking a huge place constituted of many hills, and there was not terrorist adjacent to the Syrian troops there. At the same time, the ISIS troops or the ISIS militants attacked right away after the American strike. How could they know that the Americans are going to attack that position in order to gather their militants to attack right away and to capture it one hour after the strike? So it was definitely intentional, not unintentional as they claimed. Question 4: Did Syria or Russia launch the attack on the Red Crescent convoy this week, and should Moscow be held responsible, as the White House has said? President Assad:No, first of all, there have been tens, maybe, of convoys from different organizations around the world, coming to different areas in Syria for the last few years. It has never happened before, so why to happen now, either by the Russians or the Syrians? No, it’s a claim. And regarding the claim of the White House yesterday, accusing either the Syrians or the Russians. In that regard, I would say whatever the American officials said about the conflicts in Syria in general has no credibility. Whatever they say, it’s just lies and, let’s say, bubbles, has no foundation on the ground. Question 5: So what happened to the convoy? Who should be held responsible? President Assad:Those convoys were in the area of the militants, the area under the control of the terrorists. That’s what they should accuse first: the people or the militants, the terrorists who are responsible for the security of this convoy. So, we don’t have any idea about what happened. The only thing that we saw was a video of a burnt car, destroyed trucks, nothing else. Question 6: Several eyewitnesses have told AP that 20 missiles were launched against the convoy. There is footage of torn bodies. This does not seem as though it would be anything but an attack from the air. Eyewitnesses are also talking about barrel bombs, and as you are aware, your administration has been accused of using barrel bombs in some circumstances. You still think this was an attack from the ground by rebels? President Assad:Yeah, first of all, even the United Nations said that there were no airstrikes against that convoy. That was yesterday. Second, at the same time of that event, the terrorists were attacking the Syrian troops by missiles. They launched missile attacks, we didn’t respond. Third, you cannot talk about eyewitnesses for such judgment or accusation. What are the credibility of those eyewitnesses, who are they? We don’t know. Question 7: We have eyewitnesses that were relatives, we have the White Helmets, we have many people saying that they witnessed helicopters in the air. Now, only the Syrians and the Russians have helicopters. Are you saying this is just invented? President Assad:Those witnesses only appear when there’s an accusation against the Syrian Army or the Russian, but when the terrorists commit a crime or massacre or anything, you don’t see any witnesses, and you don’t hear about those White Helmets. So, what a coincidence. No, actually, we don’t have any interest in doing so for one reason: because if we attack any convoy that’s going to the civilians, we are working for the interest of the terrorists, that will play into their hands directly, in that regard we are pushing the civilians toward the terrorists, we put them in their laps, and we are providing the terrorists with a good incubator, something we wouldn’t do. This is first. Second, we are, as a government, as officials, we are committed morally toward the Syrian people, morally, constitutionally, and legally, to help them in every aspect to have the basic needs for their livelihood. Question 8: Your administration has denied the use of chemical weapons, of barrel bombs, despite testimony and video and the results of a UN investigation. We also are hearing similar denials about airstrikes on civilians and medical workers. Can this all be false allegations by your opponents? 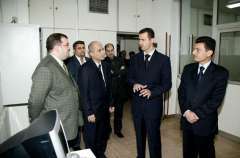 President Assad:First of all, the first incident of gas use in Syria was in Aleppo about more than three years ago, and we were the ones who invited the United Nations to send a delegation for investigations about the use of chemical weapons, and the United States objected and opposed that action for one reason; because if there’s investigations, they’re going to discover that the terrorists used gas, not the Syrian Army. In that regard, in that case, the United States won’t be able to accuse Syria. That’s why they were opposing that delegation. In every incident, we asked the United Nations to send a delegation, and we are still insisting on that position, that they have to send delegations to make investigation, but the United States is opposing. So, actually, if we’ve been using that, we wouldn’t ask for investigation. Question 9: To the international community, it seems as though none of the charges or accusations stick, that everything is denied, everything here is ok, by your administration. Do you not feel that that undermines the credibility? In other instances, the Americans for example admitted the attack on the Syrian military was a mistake. Now, you don’t accept that, but from the Syrian administration, all the international community hears is denial. President Assad: Regarding which issue? President Assad: Look, if you want to talk about mistakes, every country has mistakes, every government has mistakes, every person has mistakes. When you have a war, you have more mistakes. That’s the natural thing. But the accusations have no foundation regarding Syria. When they talk about barrel bombs, what are barrel bombs? It’s just a title they use in order to show something which is very evil that could kill people indiscriminately, and as I said, because in the media “when it bleeds, it leads.” They don’t talk about bombs; they call it barrel bombs. A bomb is a bomb, what’s the difference between different kinds of bombs? All bombs are to kill, but it’s about how to use it. When you use an armament, you use it to defend the civilians. You kill terrorists in order to defend civilians. That’s the natural role of any army in the world. When you have terrorists, you don’t throw at them balloons or you don’t use rubber sticks, for example. You have to use armaments. So, it’s not about what the kind of armament, it’s about how to use it, and they want to use it that time to accuse the Syrian Army of killing civilians. We don’t kill civilians, because we don’t have the moral incentive, we don’t have the interest to kill civilians. It’s our people, who support us. If you want to kill the Syrian people, who’s going to support us as a government, as officials? No one. So, in reality, you cannot withstand for five years and more against all those countries, the West, and the Gulf states, the petrodollars, and all this propaganda, the strongest media corporations around the world, if you don’t have the support of your own people. That’s against the reality. So, no, we don’t use it. I wouldn’t say that we don’t have mistakes. Again, that many mistakes that have been committed by individuals, but there’s a difference between a mistake or even a crime that’s been committed by an individual, and between a policy of crime that’s been implemented or adopted by a government. We don’t have such a policy. Question 11: And yet the hundreds of thousands of Syrians who are fleeing the country, many drowning on the way, many of them say they are fleeing your forces. What exactly are they fleeing if this campaign doesn’t exist, if this campaign of violence, indiscriminate against them…? President Assad: You have to look at the reality in Syria. Whenever we liberate any city or village from the terrorists, the civilians will go back to the city, while they flee that city when the terrorists attack that area, the opposite. So, they flee, first of all, the war itself; they flee the area under the control of the terrorists, they flee the difficult situation because of the embargo by the West on Syria. So, many people, they flee not the war itself, but the consequences of the war, because they want to live, they want to have the basic needs for their livelihood, they don’t have it. They have to flee these circumstances, not necessarily the security situation itself. So, you have different reasons for the people or the refugees to leave Syria. Many many of them supported the government in the recent elections, the presidential elections, in different countries. So, that’s not true that they left Syria because of the government, and those accusations mean that the government is killing the people, while the terrorists, mainly Al Qaeda and al-Nusra and other Al Qaeda-affiliated organizations or groups protected the civilians. Is that the accusation? No-one can believe it, actually. Question 12: Let’s turn our attention to the people that can’t flee, the people who are in besieged cities around Syria. For example, Aleppo. To go back to the ceasefire agreement, aid was supposed to get into the city, but you did not hold up your end of the agreement. Why was that, and how can you really justify withholding aid to cities? President Assad: Again, if we talk about the last few years, many aid convoys came to different cities, so why does the Syrian government prevent a convoy from coming to Aleppo for example, while allowing the others to reach other areas? This is contradiction, you cannot explain it, it’s not palatable. This is first. Second, if you look at the others areas under the control of the terrorists, we’re still sending vaccines from the Syrian government’s budget, we’re still sending salaries to the employees from the Syrian government’s budget. So, how can we do this and at the same time push the people toward starvation in other areas? More importantly, the terrorists who left liberated areas under what you call reconciliation or certain agreements in different areas, they left to fight with other terrorists in Syria while they send their families to live under the supervision of the government. Why didn’t we put those families to starvation? So, this is contradicting, I mean what you’re talking about is contradicting the reality, and we don’t contradict ourselves. Question 13: But the world saw the reality of Aleppo. There were UN convoys of aid that were not allowed into the city. Are you denying that that was the case? President Assad: The situation has been like this for years now. If there’s really a siege around the city of Aleppo, people would have been dead by now. This is first. Second, more importantly, they’ve been shelling the neighboring areas and the positions of the Syrian Army for years, non-stop shelling of mortars and different kinds of lethal bombs. How could they be starving while at the same time they can have armaments? How can we prevent the food and the medical aid from reaching that area and we cannot stop the armaments form reaching that area, which is not logical? Question 14: So what is your message to the people to Aleppo, who are saying the opposite, that they are hungry, that they are suffering malnutrition, that there are no doctors, that doctors have been targeted and killed in airstrikes, that they are under siege and they are dying? What is your message to them? President Assad: You can’t say “the people of Aleppo” because the majority of the people of Aleppo are living in the area under the control of the government, so you cannot talk about the people of Aleppo. If you want to talk about some who allegedly are claiming this, we tell them how could you still be alive? Why don’t you have, for example, an epidemic, if you don’t have doctors? How could you say that we attacked, they accuse Syria of attacking hospitals, so you have hospitals and you have doctors and you have everything. How could you have them? How could you have armaments? That’s the question. How can you get armaments to your people, if you claim that you have people and grassroots while you don’t have food? They have to explain; I don’t have to explain. The reality is telling. Question 15: Yet, they say the opposite. They say they are surviving on whatever they can, on meager means, and they are a city under siege. You do not accept that Aleppo is a city under siege with people starving and hungry? President Assad: Again, how can I prevent the food, and not prevent the armament? Logically, how? If I can prevent food, I should be able to prevent armaments. If I don’t prevent armaments, that means everything else will pass to Aleppo. Question 16: Have you been to Aleppo recently? Will you go to Aleppo? 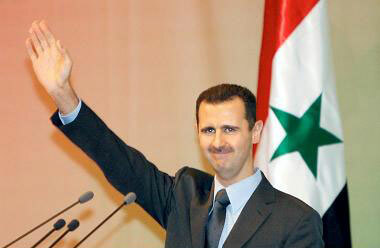 President Assad: Of course I will go. 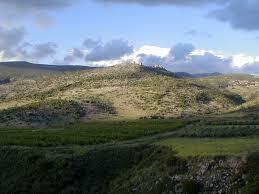 Question 17: And how does it feel for you to see the devastation in parts of what was known as the jewel of Syria? President Assad: Devastation is painful, of course, but we can rebuild our country. We’re going to do that. Someday the war will stop. The most painful is the devastation of the society, the killing, the blood-shedding, something we live with every hour and every day. But how would I think? I think when I see those pictures how would Western officials feel when they look at this devastation and these killing pictures and they know that their hands are stained with their blood, that they committed the crime directly in killing those people and destroying our civilization. That’s what I think about. Question 18: Yet, to the outside world, it feels as though the end justifies any means in your war on terror. Do you accept that? 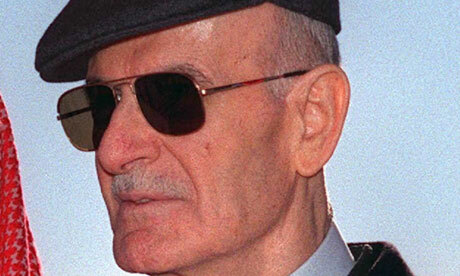 President Assad: They don’t have morals, of course. This is a Machiavellian principle; the end justifies the means. We don’t accept it, no. Your policy should be a mixture between your interests and how you reach your ends, but based on values. It cannot be only the end justifies the means, because for the criminals, ends justify the means, for thieves, for every illegal and immoral action, the end justifies the means. That’s exactly what you mentioned in your question, this is the base, the foundation of the Western policy around the world these days. Question 19: What is your message to the Syrians who have fled the country? Some of them didn’t make it, others did. Do you call on them to come back, do you expect them to come back? President Assad: Of course. It’s a loss, it’s a great loss. The worst loss for any country is not the infrastructure or the buildings or the material loss; actually, it’s the human resources loss, something we want to see coming back to Syria, and I’m sure that the majority of those Syrians who left Syria, they will go back when the security and when the life goes back to its normality and the minimal requirements for livelihood will be affordable to them, they will go back. I am not worried about this. Question 20: Do you have any expectation of when that will happen, when Syria will be pacified to some degree that they can come back? President Assad: If we look at it according to the internal Syrian factors, I would say it’s very soon, a few months, and I’m sure about that, I’m not exaggerating, but when you talk about it as part of a global conflict and a regional conflict, when you have many external factors that you don’t control, it’s going to drag on and no-one in this world can tell you when but the countries, the governments, the officials who support directly the terrorists. Only they know, because they know when they’re going to stop supporting those terrorists, and this is where the situation in Syria is going to be solved without any real obstacles. Question 21: So, let’s just dwell on that point for a moment. Do you believe that within a couple of months the situation in Syria will have dramatically changed in your favor to the point that refugees can come back? President Assad: No, because I don’t believe that in a couple of months Erdogan and the United States regime, and the Western regimes in general, and of course Saudi Arabia and Qatar, are going to stop the support of the terrorists. I don’t see it in the next two months. Question 22: So how can you really incite Syrians to come back in two months as you said? President Assad: I said if there are no external factors. I said if you look at it as an isolated case, as a Syrian case, which is theoretical, I mean, this is where you can say that in few months you can solve it. But now you’re talking about an arena which is part of the international and regional arena, not isolated. So, this is why I said no-one has the answer when will it end. Question 23: It’s now one year since Russia got involved in the war. Before the intervention you were losing territory and control. Did you ever feel like you were losing the war? President Assad: We didn’t look at it that way, to lose the war, because whenever you have Syrians working with the terrorists, it’s a loss. How to lose the war, this is hypothetical question, to be frank. It’s not about your feeling; it’s about the reality. In the war, you lose areas, but you recapture another area. So, it is difficult to tell whether you are losing or gaining or it was a standstill. No-one has this answer. But definitely, after the Russian intervention and supporting the Syrian Army, legally of course, we felt much much better. 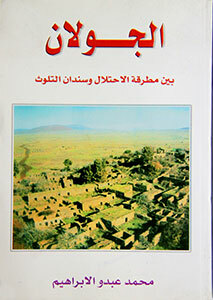 We captured many main cities, many main positions at the expense of the terrorists’ areas. Question 24: Even if you were to win the war, what would be left of your country and Syrian society? Will you have to think again about the prospect of a partition in Syria? 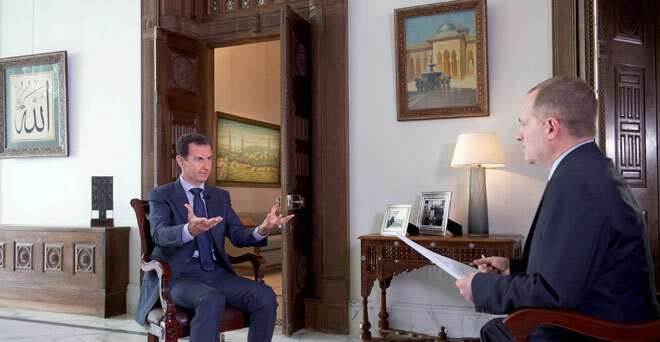 President Assad: No, we never thought about it, and the majority in Syria don’t believe in this, and I don’t think the reality, in spite of this savage war, has created the atmosphere for such partition. Actually, in many areas, the social situation is much better, because when you want to talk about partition you need to find these borders between the social communities. You cannot have partition only on political bases or geographic bases. It should be social first of all when the communities do not live with each other. 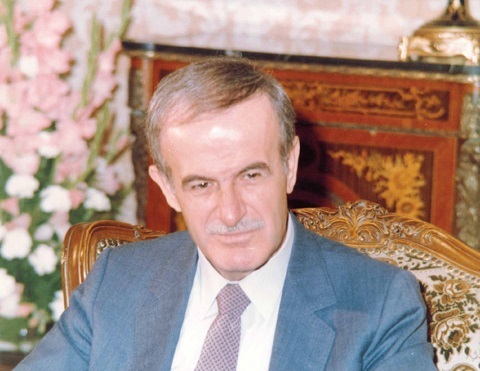 As a result of the war, many Syrians understand that the only way to protect your country is to live with each other with integration, not only in coexistence, which is actually more precise to call cohabitation, when people interact and integrate with each other on daily basis in every detail. So, I think in this regard I am more assured that Syria will be more unified. So, the only problem now that we face is not the partition, but terrorism. Question 25: And yet you are not seen as a unifying force in Syria; people think that the society is torn apart. Just to use one example, on a personal level, you trained as a doctor and yet your administration stands accused of targeting medical and rescue workers as they race to save lives. How do you make peace with this? And is this a society that, after suffering such consequences, can really just forget the past and move on? President Assad: I cannot answer that question while it’s filled with misinformation. Let us correct it first. We don’t attack any hospital. Again, as I said, this is against our interests. If you put aside the morals, that we do not do it morally, if I put it aside, I am talking about now, let’s say, the ends justify the means, if I want to use it, we don’t have interest. This is how we can help the terrorists if we attack hospitals, schools, and things like this. Of course, whenever you have a war, the civilians and the innocents will pay the price. That’s in any war, any war is a bad war. There is no good war. In any war, people will pay the price, but I’m talking about the policy of the government, of the army; we don’t attack any hospital. We don’t have any interest in attacking hospitals. So, what is the other part of the question? Sorry, to remind me. Question 26: That’s ok, that fits into the general question, but I would like to follow up with: others say the opposite, including medical workers and including the Syrian White Helmets. If you value their work, racing to the scene of whatever it may, to try and save lives, does that mean you would support the recent nomination of the White Helmets for a Nobel Peace Prize? President Assad: It is not about the White Helmets, whether they are credible or not, because some organizations are politicized, but they use different humanitarian masks and umbrellas just to implement certain agenda. But, generally if you want to talk about the humanitarian support, how can I attack hospitals while I am sending vaccines, for example? Just explain it. You tell me two different things, two contradicting things; one that I am talking about is reality, because everybody knows that we are sending vaccines, the other one is that we are attacking hospitals. They do not match. Question 27: Would you support them for a Nobel Peace Prize? Question 28: The White Helmets. 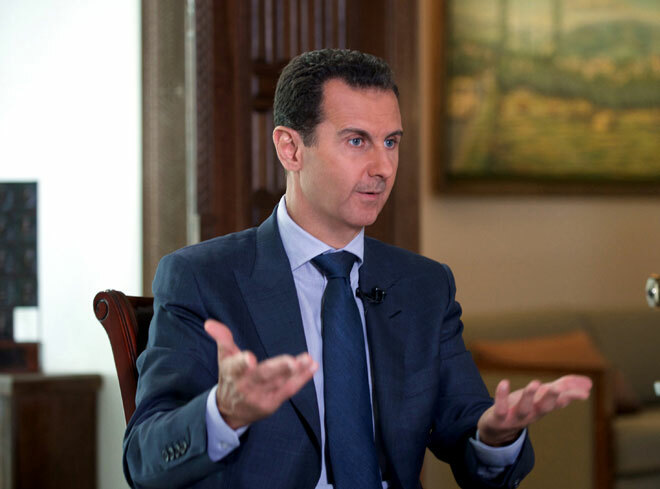 President Assad: What did they achieve in Syria? And how un-politicized is the Nobel Prize? That’s the other question. So, if I get an answer to these two questions, I can answer you. But I would only give a prize to whoever works for the peace in Syria, first of all by stopping the terrorists from flowing towards Syria, only. Question 29: My last question: The US election is now just a few weeks away. How do you expect that a Clinton or Trump presidency would differ in terms of US policy towards Syria, and specifically towards you? 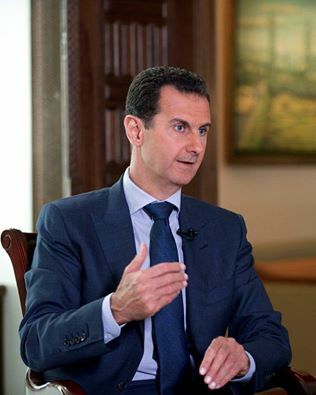 President Assad: The problem with every American candidate regarding the presidency, I am not talking only about this campaign or elections, but generally, that they say something during the campaign and they do the opposite after the campaign. As we see now the American officials, they say something in the morning and they do the opposite in the evening. So, you cannot judge those people according to what they say. You cannot take them at their words, to be frank. We don’t listen to their statements, we don’t care about it, we don’t believe it. We have to wait till they become presidents, we have to watch their policy and their actions and their behaviors. We do not have a lot of expectations, we never had. We have hopes that we can see rational American presidents; fair, obey the international law, deal with other countries according to mutual respect, parity, etc., but we all know that this is only wishful thinking and fantasy. 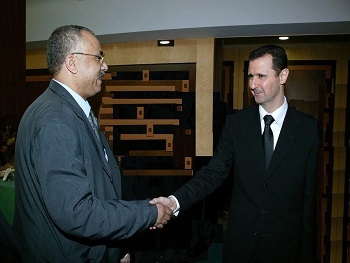 Journalist: Thank very much, President Assad. President Assad's Interview with NBC News, July 14, 2016.